Ignatius Perrish spent the night drunk and doing terrible things. He woke up the next morning with a pair of horns growing from his temples. At first, Ig thought the horns were a hallucination, the product of a mind damaged by rage and grief. He had spent the last year in a lonely, private purgatory, following the death of his beloved, Merrin Williams, who had been raped and murdered under inexplicable circumstances. A mental breakdown would have been the most natural thing in the world. But there was nothing natural about the horns, which were all too real. Once, the righteous Ig had enjoyed the life of the blessed. But Merrin's death damned all that. The only suspect in the crime, Ig was never charged or tried. And he was never cleared. Nothing Ig can do or say matters. Everyone it seems, including God, has abandoned him. Everyone that is, but the devil inside. . . .
Now Ig is possessed of a terrible new power—a macabre talent he intends to use to find the monster who killed Merrin and destroyed his life. It's time for a little revenge . . . it's time the devil had his due . . .
Man, I have become somewhat obsessed with Joe Hill since I read his novel, Heart-Shaped Box, a few months ago. I had previously listened to the audiobook version of his graphic novel series, Locke and Key, which was exceptional, but it wasn't until I read his full-length novel that I knew I wanted to read, listen, absorb...whatever you want to call it!...all of his stories. I can't seem to get enough! I've purchased all of his books, including his newest collection of short novels, Strange Weather, which I read as soon as it came out (review to come soon!). 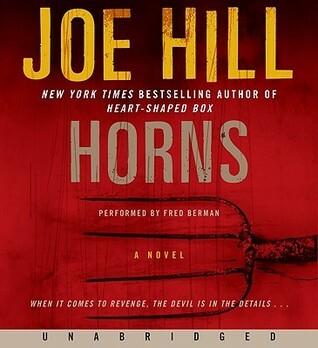 I decided to check out the audiobook version of Horns from my library, just to see how it might compare to the audiobook version of Locke and Key and to change up the way I'm experiencing Hill's novels, and I'm so glad I did because the narrator took this already intriguing and unique story and made it even better! Layered beneath this main situation is a tender first-love story, one that had a tragic ending but is quite beautiful when you discover all the pieces. Ig really is an exceptional character, kind and giving to a fault before Merrin's death and, funny enough, easy to manipulate by those that he cares about (which the worst characters, we discover, use to their advantage). There's also the fact that Ig's father and brother are both famous musicians (who play the HORN!) but Ig has never been able to play successfully because of his asthma. However, he does have a huge love of music and that musicality weaves throughout the story. The narrator of Horns was phenomenal! He kept the tension thick - even screaming when a character was described as doing so! - and did an exceptional job of appropriately balancing the depravity and beauty interlaced within the overall story. He altered the voices between characters as I always appreciate and kept me wanting to listen to more even when I knew I had to stop. I can't think of anything else I would want in an audiobook narrator. While I didn't love this audiobook as much as Hill's Locke and Key series (that would be really hard to do as it was the best audiobook I have ever listened to), Horns came in not far behind. It is an exceptional story with so many elements - the supernatural, horror, mystery, thriller, romance - and I can't really think of anything I would have wanted changed. It's just a really interesting and unusual story! The cover doesn't really do anything for me. It's okay and obviously fits the story well, but it doesn't really draw the eye. I borrowed a copy of Horns from my library's Overdrive account. All opinions are mine alone. To find more information about the book, including other reviews and links to where you can purchase a copy, see Goodreads HERE.